Our best selling, lightweight road stem. Precision forged from aluminium with carefully optimized tube thicknesses to offer the perfect blend of flex free strength and lightweight performance. 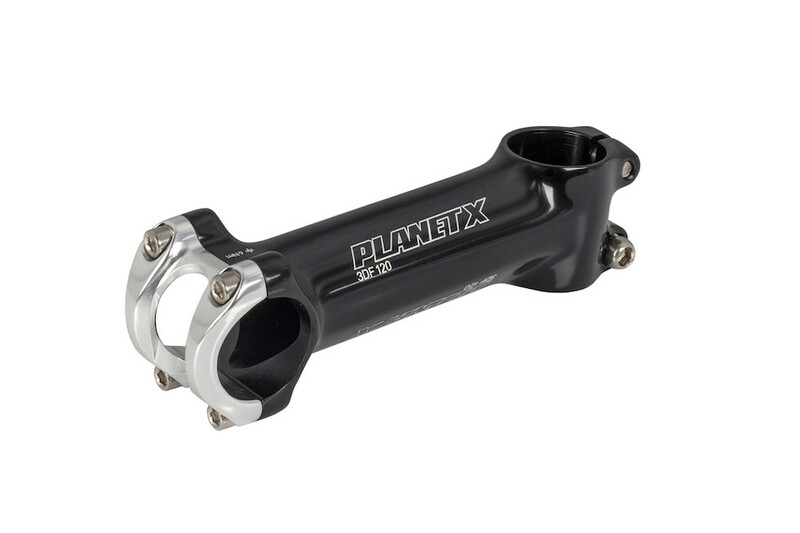 Cold forged from 7075 billet aluminium, with minimal machining to retain grain structure, the stem is available in oversize and standard options, in lengths from 80 to 130mm in 10mm increments and in standard and 31.8mm oversize sizes. 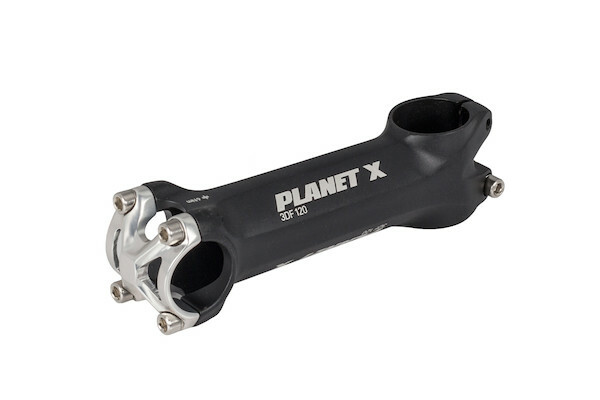 Race proven by the Planet X Team and used on the Milk Ras 2004 by the winner Dave McCann. Note: The 17deg rise stems are in 31.8 oversized clamp only. Torque settings The torque settings are 6-8 Nm for all the bolts on the stem, but tighten and check for movement as you go. no need to go to the max if the bars are solid at 6 Nm. Very nicely made stem, especially in white with the X shaped front plate. Better finished than the equivalent priced items from Easton, Pro etc. Ordered the stem one day, got it the next, really pleased with it - stiff, light, looks great. Swapped from a 110mm stock stem to this one in 90mm, has made the world of difference. I nearly got a FSA stem but plumped for this one, so glad I did, great value too. Cheers! Sorry Rah, we don't don't do the white in 26mm. Hi, do you do a white one with 26mm clamp - 100 or 110mm? Yes, Genci, these are really fine for MTB. A bit extraordinary but fully practical and really comfortable! Give the Mary bars a go and find out yourself. Lightweight, high quality, flat bar for MTB / hybrid use, comes in six different colours. 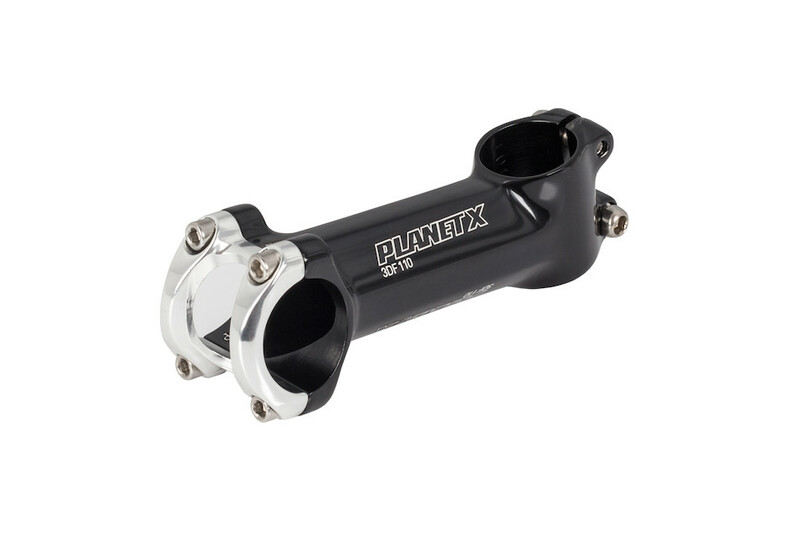 A high performance stem available at an incredible price. Get one while these last! Soft foam lock-on MTB grips with a pleasingly undulating grip shape. 35-33mm thick and 120mm long across the grip. The On-One Half Bob are the perfect grip for all but the gnarliest riders. Good quality and classically-looking cloth bar tape from Velox! Sold individually, 2 required for a full bar wrap.